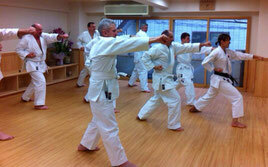 The basic discipline for martial arts is the same, “to start with a bow, and to end with a bow”. Although a martial art could be sometimes dangerous, it maintains the entirety as a sport by respecting courtesy. 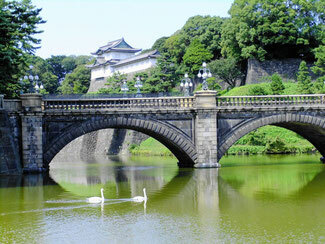 The imperial palace situates in the center of Tokyo with approximately five kilometers around. It is located in the former site of Edo Castle. From 17th century to the latter half of 19th century, Edo Castle had been the seat of Tokugawa Shogun and Japan’s military and political center. It was surrounded by water moats and massive stone walls. The residences of feudal lords were located around the Castle. Since the Meiji Restoration, it has been the residence of Japan’s Imperial family. The current Emperor is the descendant of world’s oldest imperial lineage. Welcoming parties for heads of other nations are held at the Imperial Palace. The Imperial Palace is also popular among tourists. You can view the Nijubashi, meaning double bridges, from Kokyo Gaien, a large plaza in front of the Imperial Palace. Some people enjoy jogging on the pavements of the plaza where lots of beautiful pine trees are planted. The East Gardens of Imperial Palace is recommendable as you can see the former site of the main building of the castle and the remaining foundation of the castle tower. At the time of cherry blossom and autumn leaves, Inui Dori Street in the Imperial Palace is open to public, and enjoyed by a lot of people. “Shichi go san” literally means seven five three. 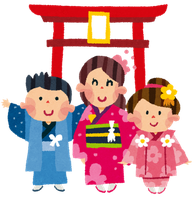 Children at these ages are taken to a Shinto shrine by their parents or grandparents on November 15th. It’s a celebration for the children’s growth. 3-year-old and 5-year-old boys and 3-year-old and 7-year-old girls celebrate this event with their family. In olden times, since medicine was not yet developed, a lot of young children died before they reached these ages. So, the parents celebrated their children when they grew up to be these ages. Today in November we see some young children dressed in traditional kimono visiting Shinto shrines with their parents. At the shrine, a Shinto priest holds a sacred service to pray for the growth and happiness of the children. After visiting shrines, they eat red and white candy sticks called “chitose” candy. “Chitose” means a thousand years. The candies are in a bag with illustrations of cranes and turtles. According to legends, cranes live one thousand years and turtles live ten thousand years. They are the symbols of longevity in Japan. The Three Mountains of Dewa (出羽三山 Dewa Sanzan) refer to the three sacred mountains of Mount Haguro, Mount Gassan, and Mount Yudono located in the ancient province of Dewa (currently Yamagata Prefecture). Holy to the Japanese Shinto religion and especially mountain worship (Shugendo), Dewa Sanzan are a popular pilgrimage site visited by many including famed haiku poet Matsuo Basho. 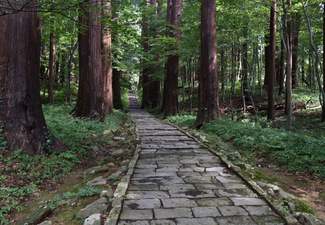 The Dewa Sanzan are particularly noteworthy as having the oldest history of mountain worship in Japan. The mountains were first opened as a religious center over 1400 years ago in 593. Since then many people have been making yearly pilgrimages. Following the Meiji Restoration in 1868, the government dissolved the Shinto-Buddhist amalgamation and Shinto was selected as the official state religion. Shugendo was adversely affected by this move and many shugendo priests became Shinto priests or Buddhist monks. When we meet someone, we make a bow. While we do this, the most vital part of your body is exposed to other people, means no hostility on the scene. A slight nod is for casual hello, 30-degree bow on formal occasions. A profound, 45-degree bow is to extend sincere appreciation or apology. We slurp noodles to enjoy our meal while they are steaming hot, and blow on foods to make the most of the right time to taste. We say sorry even if we are not wrong. In our culture, saying sorry doesn’t mean you are at fault, and then ‘sorry word’ is very often used to avoid confrontation and for trouble-free communication. Ukiyo means ‘this world’ in which people live, and people’s lives were put in ‘Ukiyo-e’: beautiful women, kabuki actors, sumo wrestlers, customs, scenic spots and the supernatural and so forth. 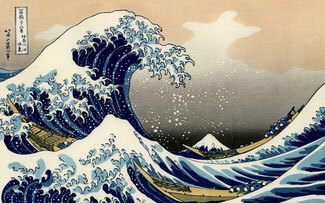 In other times, the theme of Japanese art was based on Chinese legends. In pre-modern era, it was widely spread as high degree of mass produced woodblock printings, and sold at around 800 yen a piece. Ukiyo-e was an illustration for people in general, very much opposite to those of the West, and unprecedented in art history. Also the sophisticated technique influenced on the Impressionists. Sakoku means a seclusion policy enforced by the Tokugawa Shogunate from the early 17th century to the mid19th century. 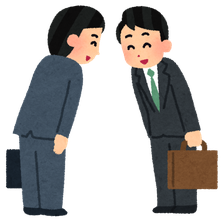 It was the foreign relations policy under which no foreigner could enter Japan nor any Japanese could leave the country. The penalty was death. 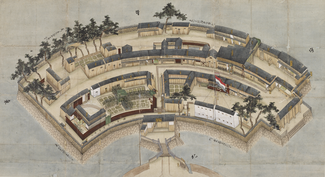 They restricted trading with overseas only to Dejima, a small artificial island constructed in Nagasaki. They had relations with Holland, China, Korea and Ryukyu alone. Dry landscape gardens were created at Zen Buddhist temples during the Muromachi period, from the middle of 14th to the late 16th century. In this garden style, carefully chosen rocks and stones are arranged on raked gravel or sand. Rocks represent mountains or islands and the raked gravel or sand represent flow or ripples of rivers or oceans. The gardens are intended to express the essence of nature, not its actual appearance, and to serve as an aid to meditation. This sort of garden is relatively small, surrounded by a wall, and some are meant to be seen while seated from a single viewpoint outside of the garden, such as the porch of the hojo, the residence of the chief monk of the temple or monastery. 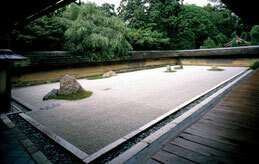 The most famous classic dry landscape garden is at Ryoanji-temple in Kyoto, where the plain, earthen walls enhance the beauty of the abstract arrangement of the stones all the more.